As an avid wristwatch collector, I keep an eye on early timepieces that go up for sale here and there on the web and in shops that I visit. I don't have any particularly valuable items myself, but I enjoy looking at (though not being responsible for the upkeep of) vintage watches from the early decades of the twentieth century. For our ghosts of 1914, wristwatches were important devices. Most people were still making the transition from pocket watches to the newer style worn on the wrist as the 1910s dawned. The below image, from David Boettcher's vintage watch strap website (which contains lots of excellently presented information about the history of military watches), shows one way to transition a pocket watch, worn on a chain at the waist, for wear at the wrist. A soldier had a particular need for an easily accessible and sturdy timepiece. As the "H. Samuel's" poster from the Imperial War Museum's collections reveals, there were even watches with "luminous dials," so that the time could be told in the dead of night or amid clouds of smoke or dust. Somewhat distressingly, these radiant dials were, quite often, rather literally radiant--painted with radium, an early luminous material for watch faces. 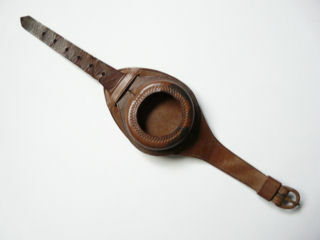 In addition to such features as the glow-in-the-dark dials, trench watches sometimes had thick leather bands that wrapped, like a cuff, around the wrist. They also sometimes came with protective metal fixtures, in the shape of a grille, flip-top, or the anachronistically named "telephone dial" style plate, to save the glass watch face from being shattered. Having access to the time was essential for planned maneuvers and other military operations. Our old friend, war cinematographer Geoffrey Malins, noted in his memoirs the hectic, almost-sickening, sense of anticipation that built as time ticked down to the planned commencement of the Battle of the Somme on 1 July, 1916. 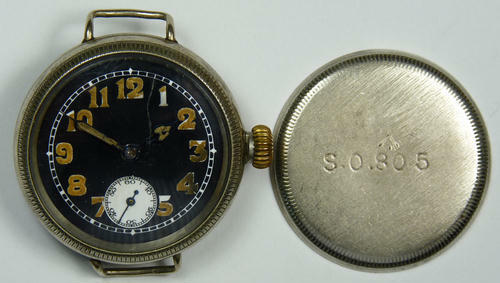 I'd like to think that having a wristwatch conveyed some sort of sense of normalcy for those on the front, giving them an indication that time was passing and that each minute would bring them nearer to the end of the war and to the moment that they would be reunited with their loved ones at home. A better, more peaceful, future was only a matter of so many spins round the numbered dial. It might have been just as difficult, however, to watch the hours ticking by on one's wrist, not sure what the coming moments would bring. Great War wristwatches are certainly a fascinating topic, and we will return to this theme another time at "Ghosts of 1914." A soldier with a disfiguring injury receives a mask. Anna Coleman Ladd Papers, 1881-1950. Archives of American Art, Smithsonian Institution. Amid the "dissertissitudes" of life lately (such as working diligently to revise or, to be more accurate, essentially rewrite a dissertation chapter), I have run across a snippet of research that I thought was good for sharing on "Ghosts of 1914." It is on the very fascinating history of plastic surgery and facial prostheses in the aftermath of WWI. A sculptor or artist at work on a mask. Anna Coleman Ladd Papers, 1881-1950. Archives of American Art, Smithsonian Institution. Soldiers who were lucky enough to survive the modern killing machines of the Great War were, quite often, injured and/or maimed in significant ways. One of the most devastating sorts of injuries for a veteran was facial disfigurement, something that could significantly challenge his chances at reintegrating into civilian life, whether at home or within his community. The field of plastic surgery, about which we remain fascinated even as its procedures become increasingly normalized in our culture (for instance, on the big or small screen, it seems near-impossible to find a female--or even, sometimes, a male--forehead not strangely immobilized or eyebrows not fiercely stretched, lips not comically blocky and protruding, etc., etc., etc. ), already existed by the time of the Great War. However, the particularly destructive technologies of the war forced the medical field to adapt in major ways to a new set of demands on their aesthetic and surgical abilities, as Smithsonian Magazine's Caroline Alexander writes in a brilliant 2007 article. Where surgery could not fully rebuild a badly-affected face, artists were employed in crafting ingenious prosthetics that could be worn over the damaged feature so as to give the soldier an approximation of his pre-war appearance. In film footage of American artist Anna Coleman Ladd at work from the Smithsonian Magazine website, it looks like plaster casts (like life-masks) of the faces of the injured are used in the process of making a facial prosthesis. At one moment, we see a soldier demonstrating just such a "mask," worn over his jaw and chin. Another is fitted with a mask that covers part of the upper portion of his face. Repairing or restoring a soldier's face was not about frivolous vanity or a quest for some sort of ideal beauty. Instead, it had everything to do with restoring a soldier's place on the homefront--with repairing or at least helping to support the bridge between the worlds of combat and civilian life. Caroline Alexander: "Faces of War." Smithsonian Magazine, 2007. Anna Coleman Ladd Papers, Archives of American Art, Smithsonian Institution. Gillies HD. Plastic Surgery of the Face. Henry Frowde. 1920, 1983. Happy New Year to my readers! I wish you all the best in 2012. The turn of the new year is a time when the present breaks away, actually and symbolically, from the past. It is a time when our thoughts often turn to what is next and to what we will do to make the future different from what has come before. As I reflected on where to go next here at "Ghosts of 1914," I thought I would mention a text that has a lot to do with the boundaries between past, present, and future: Lytton Strachey's Eminent Victorians, published in 1918. Though this quartet of biographical portraits concerns celebrated figures from the Victorian era, it speaks volumes about the distance that some modern Britons wanted to put between themselves and that storied recent period in England. For Strachey, a Bloomsbury Group pacifist and conscientious objector who wrote the four biographies over the war years, Eminent Victorians was a way of taking a stand against the past's power to define the present and future. We might consider Strachey's position on the war to be one of unwillingness to believe that the sacrifice of individual lives was a fitting price to pay for the upholding of a propagandistically rendered British identity built on dusty Victorian ideals. Florence Nightingale, ca 1858. Portrait used in Eminent Victorians, 1918. Strachey sought to change the way we regard illustrious people of the past. Rather than granting them some kind of exalted, almost superhuman status, Strachey wanted us to consider the residents of history as people, just like ourselves. Strachey's portraits, which are meticulously detailed, fussy, unsparing, and often hilarious, don't allow his readers to envision his subjects--General Gordon, Cardinal Manning, Florence Nightingale, and Thomas Arnold--as heroes or immortals. Rather, they insist on the flawed but ultimately more accessible, realistically-proportioned, humanity of these four people. Among his other writings, Strachey would go on to pen a sensational biography of Queen Victoria, which was published in 1921. About his skillful and realistic representation of the monarch, Strachey's friend Virginia Woolf wrote that, "in time to come [his] Queen Victoria will be Queen Victoria," (Woolf, "The Art of Biography"). Using writing as a tool for pacifism was a remarkable project, and Strachey's efforts to bring down the idols of the recent past so that modern Britons could be free of their firm hold on national and cultural identity are an essential aspect of Great War era British literature. For Strachey, there was hope that writing lives was a way of saving lives.